Sometimes also called American chameleons, although they are not true chameleons. They can do a color change from green to brown, especially when stressed. Quite readily available in the pet trade. Life span averages around 4 years, although they can live longer (up to 8 or more years if well cared for). Adult length of around 8 inches (including tail) in captivity (typically slightly larger in the wild). Males are larger than females and have a large dewlap (flap of skin) on the throat that is used in behavioral displays. Usually inexpensive to buy an anole, but the equipment needed to set up a proper tank is quite costly. Reasonably easy to care for if you can set up a proper tank. Can be very stressed by handling, and can drop their tails if grabbed by the tail. Anoles can be housed in a fairly small tank - a 10 gallon is sufficient for a single anole, or perhaps a pair. Larger is better, and if housing multiple anoles, lots of space is necessary. You should only keep one male anole per tank. Females will get along fine, as long as the tank is roomy enough and there plenty of basking spots and places to hide. A secure fitted lid is necessary. Substrate/furnishings: A substrate of peat moss and soil with or without a layer of bark (e.g. orchid bark) is an ideal substrate for anoles. Live plants help maintain humidity and provide cover - try Sansevierias (snake plants), bromeliads, philodendrons, ivy, orchids and vines. Pieces of bark and branches should also be provided for climbing and basking. Temperature: during the day, provide a gradient from 75-80 F (24-27 C) with a basking spot of 85-90 F (29-32 C). A combination of under tank heating and a basking light on one side of the tank works well. Make sure the appropriate temperature gradient is provided by measuring temperatures in various spots around the tank. Night temperature can drop to a gradient of 65-75 F (18-24 C). Do not use basking lights to achieve night time temperatures - use heating pads and/or ceramic heating elements. Light: in addition to the incandescent basking light, provide a full spectrum UVA/UVB light for 10-12 hours per day. Water and Humidity: a humidity level of 60-70% is necessary for anoles. This can usually be achieved by misting the inside of the tank daily. It is a good idea to measure the humidity level to make sure it is adequate for anoles. Misting systems are available although they are quite expensive. If you are having a hard time maintaining the humidity level, try covering part of the top of the tank and/or increasing the number of live plants. Misting also provides drinking water for the anoles as they often will not drink from a bowl (they will lick droplets of water off the misted plants). 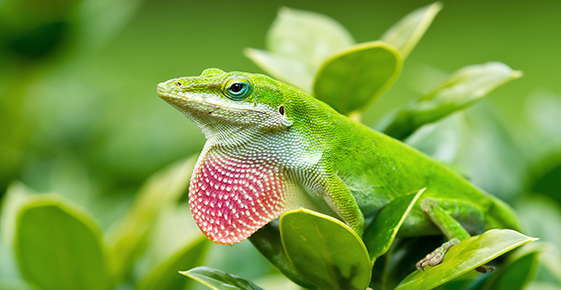 Anoles are insectivores and are generally good eaters. While crickets can be the main part of the diet, it is best to feed a variety of insects. Wild caught insects can be offered as well, if pesticide free. Crickets must be gut loaded with nutritious food prior to feeding. Feed appropriate sized prey items - about 1/2 the size of the anole's head is a good guideline. Can usually feed every other day, and 2-3 appropriately sized items per feeding. Crickets and other prey should be dusted with a quality vitamin/mineral supplement.